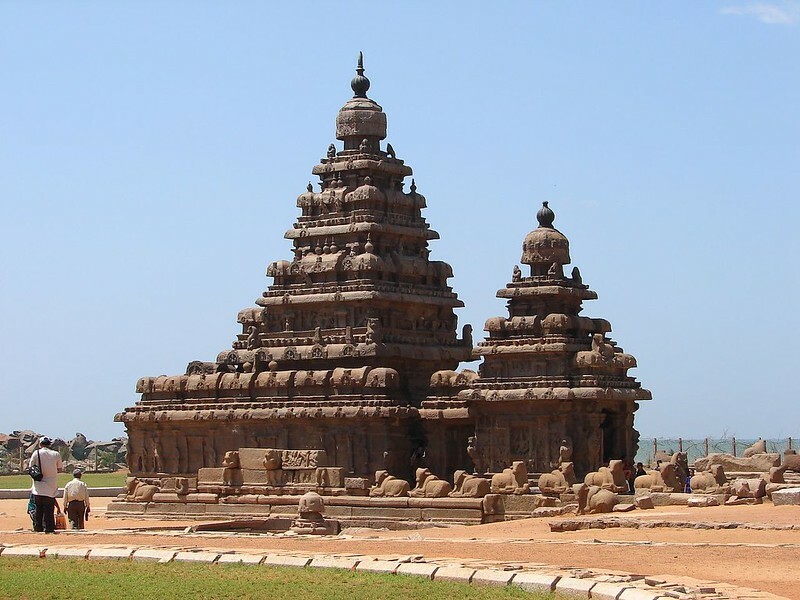 Built on the shores of Bay of Bengal in Mahabalipuram (India) in the early 8th century by the Pallava King Rajasimha. The shore temple actually consists of 2 back to back shrines, one facing the east (the bay), and the smaller one facing west. It stands on the edge of the Bay of Bengal. At high tide, the waves sweep into its compounds. The walls and their sculptures have been battered and eroded by the winds and waves for thirteen hundred years. Yet they stand intact. There is an old legend here that originally there were seven temples. Of these, six have been swallowed by the sea. Only one temple – the Shore Temple – has remained. There are evidences of submerged structures under the waves. Sporadic excavations are going on. But it is too early to say whether there really was a glorious city and six more temples which now lie submerged under the waves off the coast off Mahabalipuram. Image published by Indyblue on 2006-10-15 03:12:59 and used under Creative Commons license.